A manure management and runoff control demonstration to review low-cost options for small to medium size beef and dairy feedlot operations will be held at ISU Armstrong Farm near Lewis on Aug. 26 in southwest Iowa. Iowa State University Extension is hosting a manure management and runoff control demonstration on Friday, August 26, from 1 p.m. to 3 p.m. at the ISU Armstrong Research Farm located near Lewis in southwest Iowa. The purpose of this demonstration is to review low-cost options for managing runoff water and manure from small to medium size beef and dairy feedlot operations. "Small and medium size open feedlots can potentially discharge significant amounts of nutrients to streams," says Shawn Shouse, ISU Extension field agricultural engineer. "The nutrients can cause water quality problems in streams and present a loss of valuable fertilizer nutrients for the farm." Shouse and vegetated treatment area. Recent compliance enforcement from both the Iowa Department of Natural Resources (DNR) and the U.S. Environmental Protection Agency (EPA) has put the focus on runoff from small to medium size feedlots. Iowa State University Extension has partnered with EPA, DNR and the Iowa Cattlemen's Association to look at feedlot control systems that will reduce runoff from feedlots and are more economically feasible to install for smaller feedlots. This demonstration will look at a vegetated treatment area and pumping effluent onto cropland as a possible low-cost handling option for feedlot runoff. 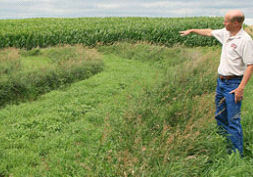 According to Kris Kohl, an ISU Extension field agricultural engineer in northwest Iowa, "Pumping effluent onto cropland is not a common practice in Iowa, but by doing so we can reduce the potential for nutrients to reach the streams. Plus, the effluent can provide nutrients and water to a growing crop." In addition to the manure control options, this field day will also include information on manure production and nutrient content of feedlot manure, how to sample manure for nutrient analysis, stockpiling regulations and an update on rules for medium size operations as well as review of other types of manure control practices. The ISU Armstrong Research Farm is located at 53020 Hitchcock Ave., Lewis, Iowa, 11 miles east of Oakland or 11 miles west of Atlantic on Hwy 6, then half mile south on 525th Street (M53) and half mile east on Hitchcock Avenue. A statewide training for commercial manure applicators will be conducted on Wednesday, Aug. 31, from 9 a.m. to noon. This training will be a reshow of the same program that was offered by Iowa State University Extension in cooperation with the Iowa Department of Natural Resources in January 2011. Commercial manure applicators that have not fulfilled their 2011 training can do so before the busy fall manure application season. Commercial manure applicators wishing to become certified for the first time may also attend. Applicators that have already attended training in 2011 do not need to attend. Iowa law requires commercial manure applicators to attend three hours of annual training and to submit the appropriate forms and fees to the Iowa DNR to meet certification requirements. Applicators may apply manure prior to receiving the certification card in the mail, but commercial applicators should carry a copy of the signed paperwork with them until they receive the certification card to prove they have attended annual training. There is no fee for the training workshop but applicators must register by Aug. 24 with the ISU Extension county office where they plan to attend. Applicators should bring their driver's license or a copy of their certification card. The counties offering this training include: Allamakee, Calhoun, Cass, Cherokee, Cerro Gordo, Clay, Clayton, Dallas, Emmet, Greene, Hamilton, Hardin, Ida, Iowa, Kossuth, Mahaska, Palo Alto, Pocahontas, Story, Tama, Warren, Washington, Wayne, Webster, Winnebago, Winneshiek and Wright. A postcard reminder will be sent to all licensed commercial manure applicator businesses in early August. Owner and managers should communicate this training opportunity to employees and new hires. If applicators cannot attend this training event, they can still call their ISU Extension county office to determine when commercial manure applicator trainings are held. Many county extension offices will provide flexibility in offering training if you call in advance, but some are only offering training on set dates due to scheduling and staffing conflicts. Applicators can also meet certification requirements by taking and passing the certification exam. Exams are only offered at Iowa DNR field offices and an appointment must be made to take the exam.